Lamberto Frescobaldi's family has been making wine for 700 years, yet he is as unabashedly New World as anyone in Tuscany. He went to UC Davis in the 1980s, entered into a partnership (since dissolved) in the Luce winery with the Mondavi family in the early '90s, and is quite thoughtful about why his company's wines today are not -- and should not be -- what they were a couple decades ago. I spoke with Lamberto by phone recently about what Italians used to want in wine, whether his wines are better than Tim Mondavi's turkey, and other topics. Read on. WBG: How has your family stayed in the wine business for 700 years? Frescobaldi: We've been respectful of the next generations. One thing about the heritage, you have to think about the transfer from the previous generation that didn't blow up everything and did something good for the business as well. You have to keep investing always. The company is the most important thing. Be modest. We don't own boats, airplanes or Ferraris, but we do own 2500 hectares of vineyards. The main focus is to have a healthy company. WBG: Why did you go to UC Davis? 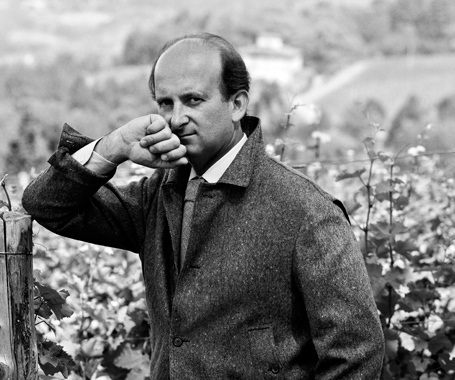 Frescobaldi: I was interested in viticulture. In an Italian university, you studied agriculture. You learned how to make olive oil, you learned to make oil from beans. The idea came from many years of how Italy was organized. A person would have some olive trees, a little vineyard, some wheat and corn and five or six cows. That was the idea of how agriculture had to be. WBG: Is Davis where you fell in love with New World wines? Frescobaldi: What UC Davis gave me was to be curious. I had the opportunity to work at Corti Brothers in Sacramento and taste many wines of the world. I developed a taste that was less local and more open to novelties. WBG: How did you meet the Mondavis? Frescobaldi: In Montalcino we were producing a wine that was 100% Merlot. Tim Mondavi tasted this wine and said, who is producing this wine? I want to meet these people. We used that Merlot to produce Luce (a super-Tuscan). The first vintage of Luce was 1993. When we presented Luce's second vintage, 1994, Tim sent me a fax that I had on my desk for a long time. He said, "I'm so happy how Luce '94 was received. But I would like you to think, what would you like to do better? Where would you like to have your vineyards, what varieties would you like to deal with, when would you like to pick?" One of the great things about Tim is that he was never happy with success. He was always saying that every vintage you could do better. He never cut corners. Coming from a culture were wine was something that had to go with your meal, making in Italy wine for every day consumption, we had different goals. Something that had more acidity, something that was less complex. You have to think 20 years ago. One of the things people were always asking was, I want a wine that is easy and ready to drink as soon as possible. Open the bottle, pop the cork, sit down, the two of us drink a bottle, and then we can stand up and drive away without going to jail. It had to be 11.5% alcohol and wash down the palate. That was really the goal. You will not drink juicy, bold wine with lunch. You would think: ripe, bad. In Italy after World War II the consumption was 120 liters per capita. Now it's about 40. In the US it's 9 liters. That changes how you approach wine. Now people are looking for wines that are still different from wines that we're talking about. They want wines that have a little more acidity and they want great quality and great complexity. A little less alcohol, maybe, but they want great complexity. Wine has much more complexity than they used to have in the '70s and '80s, that's for sure. WBG: Your winery was accused of selling false Brunello di Montalcino. Tell me the status of that case. Frescobaldi: The judge jumped on people with names who were having high ratings. One of them was us. We were not buying wines from any other place. We were only using our wines from the estate. The judge was saying, you were using some other varieties in your Brunello. We explained to him we have no interest in using Merlot in our Brunello because we are selling our Merlot for a much higher price in our IGT Lamaione. Our Brunello is a much lower price. The judge thought, that can't be true, IGTs are much less expensive than DOCG wines. But no, it's true. In the beginning of 2008, our wine was suspended from the market. After eight months, after a lot of analysis, it came out that everything was fine. The wine was given back to us. We could start selling the wine. The judge went to a different city, and then everything was forgotten. By law, if the judge doesn't close the inspection after a number of years ... everything finish. We didn't make any kind of proclamation because this was something that especially here, in Florence, was in the media every day and was then forgotten. We thought we were better off moving on and forgetting this sad story. NOTE: Frescobaldi neglected to tell me he made a plea bargain in this case. Read here for more details. WBG: You're still working with Michael Mondavi's import company, right? Frescobaldi: What happened at the end of the joint venture is something that had gone beyond our personal relationship with the family. With all of them, our relation has always been very very good. I had Thanksgiving turkey in Tim Mondavi's house in Napa last fall. We opened 13 bottles of different wines, including a couple of Luce. The turkey was good. He has a great roaster with natural fire. I must say, the turkey was good but the wines were better.